I have completely pulled the whole basement apart and the garage (our basement walks out to the garage) My sewing room is in half of the basement and there is stuff everywhere. The garage is finished and there is a light at the end of the tunnel (although faint) for my sewing room. So since there is no sewing going on right now, I thought I would share with you something I put together earlier. I love candles and Yankee candles are wonderful. I usually receive the big jars as gifts from my sister. They are $25.00 and I hate spending that much money on a candle. I normally buy the votives or the little tarts. 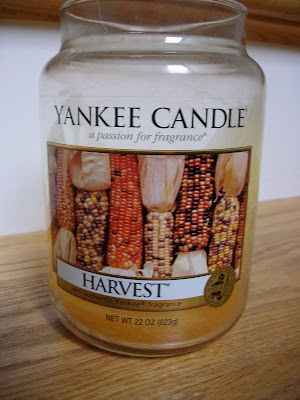 My family and I love all scents of fall: cinnamon, pumpkins, apples and all the scents of Christmas too. However, I hate when this happens...look at all that wasted wax. The picture doesn't show it well, but it is thick on all sides and on the bottom. 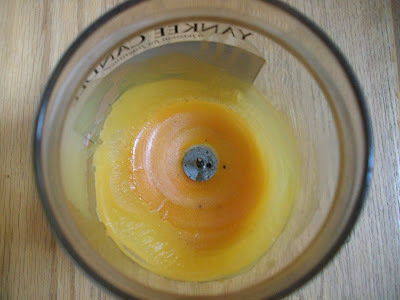 and this...the wick burns out and won't relight before the whole candle is used up. So here's what I do. Place jar in the freezer for 15-20 minutes. 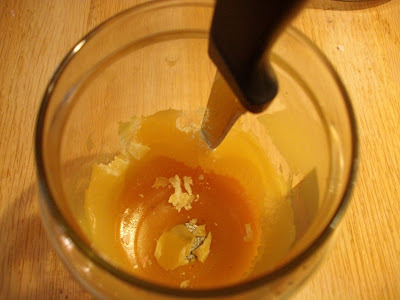 Then take a pointy knife and break up all the wax in the jar. Be careful not to hurt yourself or press too hard that you'll break the jar. If frozen or chilled it should pop right out. Chopped up the pieces so they will fit out of the top of the jar. Now, you will need a tart burner, which is the kind where you place a votive inside and melt the tarts on top. 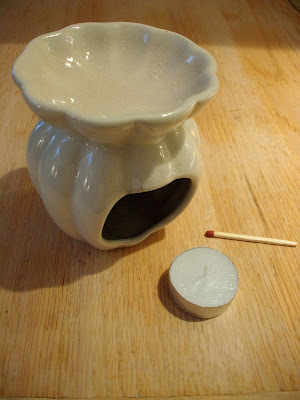 Place your broken pieces on the top of your votive burner. Not too much at first until you see how it melts. You don't want it to over flow. Maybe put it on a tray at first. Now, you are good to go again with the heavenly scents of fall. Just take the extra pieces, store in a sealed bag and label the scent. Have a great Sunday everyone and I'll be back with an update for all my I Spy swappers. I'm starting to get packages in..woo hoo!!!. I also have a final list of swappers as of yesterday. Karen - a terrific idea! I agree with you - it is so frustrating when you feel as if half of the candle is lost... will definitely give this a try. I am on the YC mailing list and get great coupons, then shop in the outlet store in Kittery. What a practical solution to a very irritating problem! Thanks for sharing it! Karen, that's a great idea... and I love your photos! 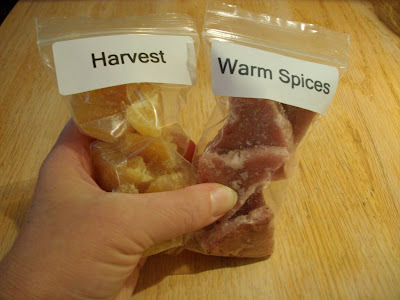 I love Autumn scents, but especially Christmassy cinnamon and clove mixes. Ooh... now I'm getting pangs of excitement for Xmas... although I really miss the cold weather from England at that time of year. A summer Xmas just isn't the same!! 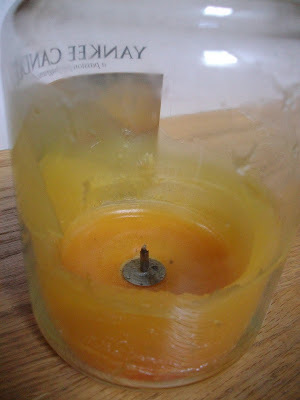 I've also heard that you can put the candle in the freezer for a few hours, and when it comes out, the piece(s) at the bottom will pop out easily. I recently bought the "Wedding Day" candle for a friend getting married next month. It's such a lovely scent! What a cleaver way to use every last bit. It always seemed like such a waste to throw that last bit away. Thank you, thank you, thank you! I am so glad that you shared this with us. I am definately going to use it in the future! I have been away on vacation (using your car caddy to hold my quilting supplies in the car) and today caught up with your posts, and the Tuesday tool for this week. Loved it and wanted to share that I also use plastic food containers. I buy salad at my local warehouse store in plastic rectangular boxes. They are perfect for stacking fat quarters on end. The heavy styrofoam trays that ground meats are packaged in are washed, cut into rectangles, covered in matching fabric and used as bag bottoms in totes and purses. Your blog is a favorite of mine and the Tool time Tuesdays are wonderful. Keep up the good work. Once againg, you are so clever....Love it!! Great idea... as usual. Does this work with all candles, or just the expensive Yankee candles? Good idea! 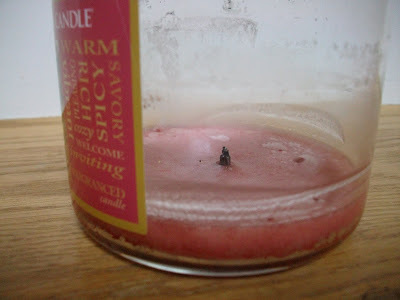 Did you know that if you pop your candle in the freezer for an hour or so, the wax comes out easily from the glass jar? No more scraping. It makes things easy to clean up too. 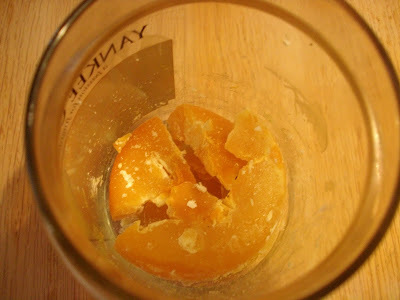 Simply break up the wax and clean the jar with Dissolve-It. Thanks again Karen, for a good idea! What a very innovative and inspiring person you are! Hope your place gets back together again soon. We are in renovation mode at the moment too but ours is upstairs. I won't be throwing the left-overs away any more. Thanks! Great idea. We have piles of old candles around the house and now I know what to do with them. I just can't figure out why I didn't think of this for myself. I have bought extra wick and done the same but put in new wicks, I really like your idea too!!! Thanks for the tip. A great way to use up those bits of wax on the sides of the jar. I too love Yankee Candle - My stash of candles could rival the store!!! Have you tried the metal rims - not sure what they call them but they are about $10 each. You put it on top of your jar candle and they burn evenly all the way to the bottom. At first I thought they just wanted me to spend more - like I need that incentive!!! But it really works and they come in all different designs. Clever idea. 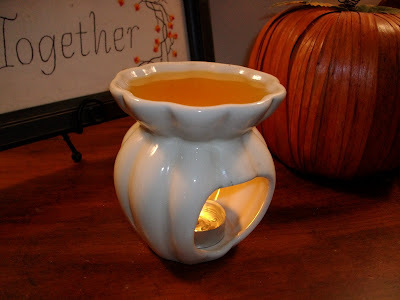 I use a electric candle warmer or all my candles, they last forever when you use one of those, I like Gold Canyon candles that are kind of pricey so I want them to last a long time. That is a great idea Karen! I have some candles that are too low to burn! Thanks for the idea, I just need to get one of those burners. P.S. Today I cut my swap fabric so I hope to ship it soon! Wow, another "why didn't I think of that" moment! Thanks for the tip! I've been doing this for years! Candles are just too expensive to waste. Fantastic idea! I have a really cute punched tin tart warmer that this would be perfect for. And don't you just LOVE the label maker. My very favorite organizing tool! I do this as well...with all my candles. I have bags and bags of chopped up candles. I never have to buy melters...lol. I do this to except I use the electric candle warmers and I pour it into a small glass candle holder and sit it on there. The reason I don't use the large Yankee candle is because it's close to the same size as the base and I'm afraid the edges of the plastic might get too hot. Anyway I also don't leave it turned on when I'm not home. I LOVE your idea for the lids of the candles! I've done this for years. Also, instead of cutting it out, you can just leave your candle on the stove while you're cooking and it will heat it up to liquid form. Check to make sure the jar isn't too hot to handle (if it is, a glove works great! 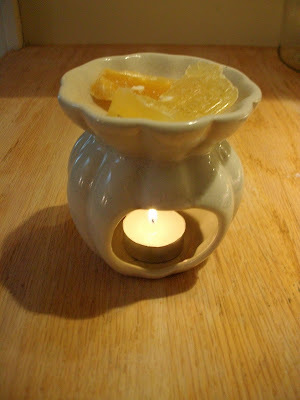 ), then pour it out into either your wax warmers, or if you have some wax molds, pour them into that for shapes. They make perfect gifts that didn't cost anything extra! Great idea, thank you! My favorite candle just burnt out yesterday and I was thinking about what I could do with the jar/wax left over. I think I'll try this today! Excellent... I like.. thanks my friend. I boil water in the tea kettle and fill the candle up to the mouth with boiling water. (You can put the candle on a paper plate in your sink.) The wax melts and rises to the top and can be easily removed after it cools. This is not a project for when small children are around. That is utterly brilliant. I can't think why it never occured to me to do this. I have a boxful of candle bits that I scraped from jars and I very nearly threw them away last week when I was destashing. I've been doing this for years!